Birke & James: Their 10-year anniversary and mine. I captured Birke and James 10th anniversary vow renewal on my 10th business anniversary. My original plans for that day were to buy myself a cupcake, put makeup on, get a few self-portraits, maybe with my birds, all surrounded by cameras. And then craft an elaborated anniversary post on all social media platforms. But then, Birke contacted me about hiring me for their vow renewal photos. 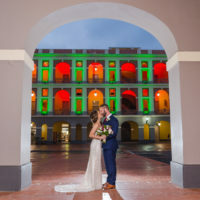 Birke and James visited Puerto Rico celebrating their upcoming 10-year anniversary and the birth of their fourth child. Somewhere along the way the decided on doing their vow renewal. Nothing big, just them and the people most important for them: the family they've created together. They didn't have a big wedding nor portraits of that moment, so having a wedding photographer for this occasion was also important for them. I helped them choose the location and perfect timing for photos, and I'm so glad of their blind trust because that day was perfect. We started with the ceremony: they had an intimate vow exchange. It's so amazing to witness such a moment, and also noticing how vows change from a wedding day to ten years later. After beautiful words of love and affirmation, they turned on a Bluetooth speaker, and shared three dances, with each other and with each one of their kids. I honestly don't think anything I tell you will make justice to how sublime and moving this moment was for me. After this intimate family moment, we walked around the beach and did the usual family vacation portrait session: some directed shots, followed by lots of images of everyone just having fun in the sun. After today's portraits with Birke, James, and their beautiful family, I quickly realized my past 10 years were nothing about selfies and cupcakes. I was all about stories, and moments as beautiful as my day with today's clients. I'm blessed and so happy to be trusted, not only with witnessing and capturing, but also influencing and being an active part hundreds of stories, new traditions, lives. Thank you for this privilege.